openlisp.el for GNU emacs. .emacs for GNU emacs. OpenLisp is a KISS (Keep It Stupid Simple) full conforming implementation of ISO/IEC 13816:2007 ISLISP Language, the International Standard version of Lisp. Entirely written in C, OpenLisp has been ported on more than 90 different architectures (compiler/OS/processor) from small 16 bits MS-DOS systems to 64 bits systems such as DEC Alpha processor. All major processors (Intel 16/32 bits, Intel IA64, AMD/Intel EM64T, Sparc 32 bits and UltraSparc 64 bits, Motorola 68k and 88k, RS6000, PowerPC, MIPS R3000/R4x00/R8000/R10000, HP PA 32 and 64 bits mode, Alpha 32 and 64 bits mode, IBM s390, StrongARM, VAX) are supported. It even runs on Pocket PC. The goal of OpenLisp is to provide an efficient, modern and complete Lisp System for those whom want embedded Lisp processing in more conventional applications written in C, C++, Java or Visual Basic. Even if OpenLisp can be used with a toplevel loop and with all goodies that an old-timer lisp user enjoy, it is more tailored to be transparently integrated in native C or C++ applications. For this purpose, OpenLisp is distributed mainly as a Lisp library (or DLL on Microsoft world) that you can integrate into your main application. It can also be compiled as a COM or CORBA server. The memory footprint is very small with less than 200 Kbytes for the complete kernel and less than 400 Kbytes for a usable Lisp System data. There is no limit on the maximum memory that the System can use. With little efforts, you can exchange data between C and Lisp. OpenLisp extends the ISLISP standard to ease port from other Lisp Language, mainly Common Lisp. The kernel can be compiled to support the UNICODE IS0/IEC 10646-1:1993 (16 bits) character sets with UTF-16 encoding instead of the IS0 8859-1 (8 bits) character sets. It also provides a consistent interface to communicate using Lisp streams with BSD, POSIX sockets and/or WinSocks sockets. Conforming implementation of ISO/IEC 13816:2007(E) ISLISP Language. High level of portability (> 90 systems from 16 to 64 bits processors - list here). Entirely written using ISO/IEC 9899:1990 C Programming Language. (no external package or library required). Extension of ISLISP I/O streams to support BSD, Winsock or POSIX sockets when available. 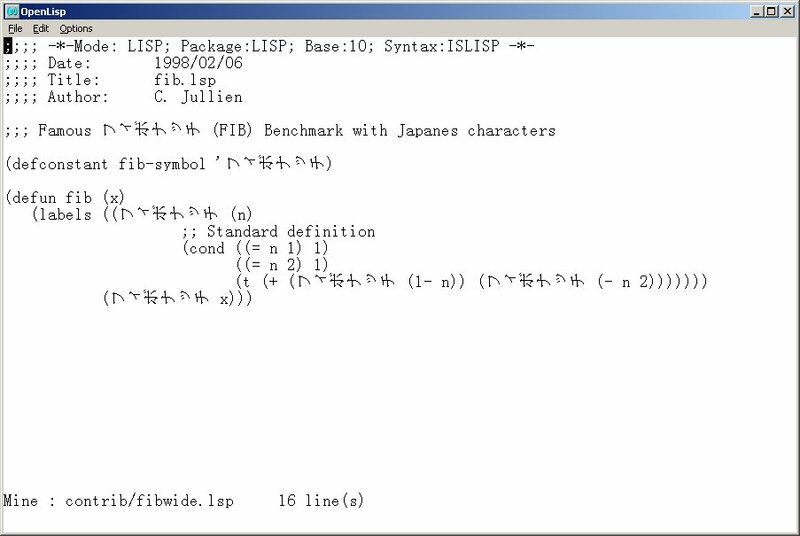 Extension of ISLISP to support UNICODE character sets (on Windows NT and some unixes like Linux and Solaris). Execore that combine a core image and OpenLisp into a standalone executable. Daemon mode where OpenLisp can be used as a daemon process (Unix). Virtual allocator and memory manager. Process functions to act as a server (fork, wait, waitpid, kill). Code can be compiled as DLL or shared library. Can be used with a database (using ODBC link). Can be used with MySQL and PostgreSQL server (both using ODBC and native client interface). Can read from an write to pipes (UNIX and WIN32). Can be compiled as COM, DCOM or CORBA server. Can be used as CGI script language. Can be used to read XML file as easily as 'read'. You can read the complete file or only sub-trees, one at a time. Can be used with mod_lisp, an Apache module to write Internet applications in Lisp. OpenLisp is a commercial product that is sold with binaries and sources (excepted memory management and evaluator). Full source licenses to make ports may be discussed. The author, Christian Jullien, is an active AFNOR expert of ISLISP normalization for more than 10 years. You can download the following OpenLisp ports free of charge for an exclusive non-commercial usage. Please download the LICENSE file if it's not already in the archive. Files with taz suffixes are Unix compressed tar (tar.Z) format. Files with tgz suffixes are Unix gzipped tar. Hints to test the UNICODE version. The Windows UNICODE version works only on Windows NT/2000/XP (not on Windows 95/98). 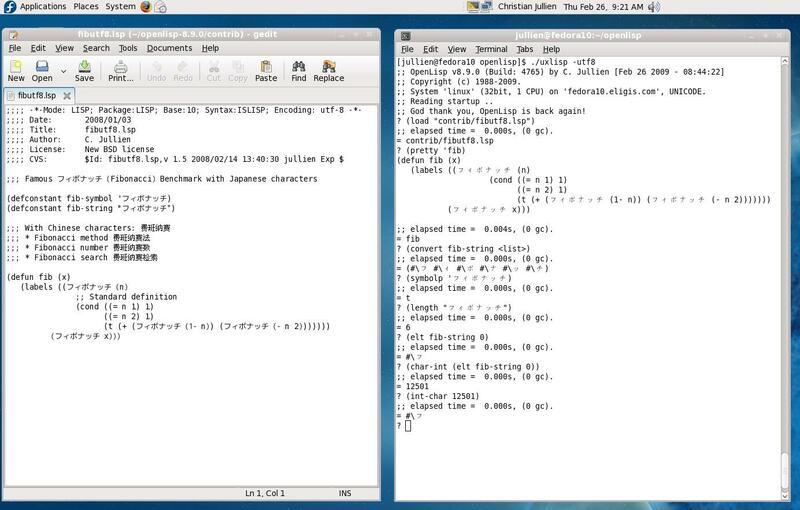 After launching OpenLisp, select Option and choose a font that supports UNICODE (MingLiU works well for Japanese on my computer - even on US NT). You can play with a rudimentary Emacs like editor and edit a sample file UNICODE that reside on ./contrib/fibwide.lsp. Site dedicated to ISLISP Programming Language. Contains Benchmarks, tests, demos, tools and other ISLISP portable code. LispIDE is a basic graphical shell for several Lisp and Scheme implementations available for Windows. 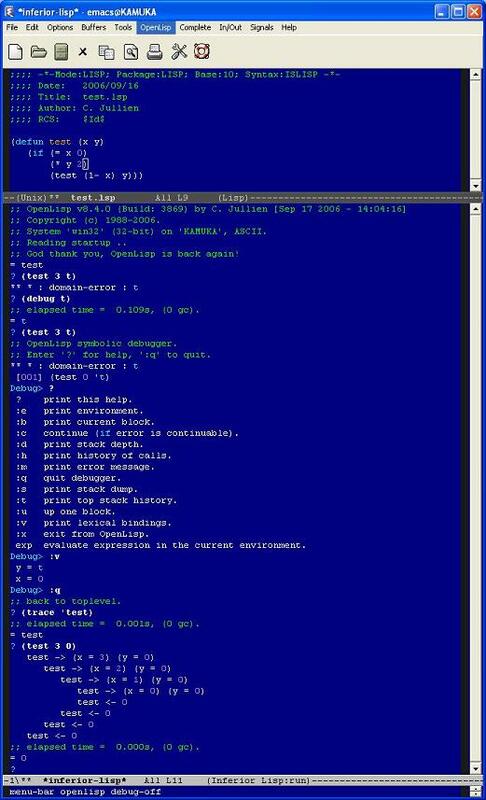 LispIDE seems to work with: Corman Common Lisp, Steel Bank Common Lisp, CLISP, Gnu Common Lisp, Gambit Scheme, Bigloo Scheme, SCM Scheme, Arc, newLISP, OpenLisp. © 1988 - 2019 Eligis. All Rights Reserved.